ALISSA DICKER is a freelance writer and cooking teacher who resides in New York City. This is Page 3 of a 10-page review. Click on the black links below to visit other pages. Husband and wife team Paolo Volpati-Kedra and Tessa Edick turn out a homemade, hand- prepared Pesto composed of the freshest ingredients—organic basil, extra virgin olive oil, Parmigiano-Reggiano, Pecorino Romano, garlic, pine nuts, salt and pepper—based on Italian family recipes. 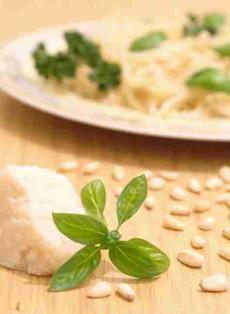 Before packing the product, which has a five-month refrigerated shelf life (unopened), they gently sauté the ingredients to draw out the flavors. The potent, chunky sauce, a mosaic of soft herb flakes and nubs of nuts and cheese, is perfect on pasta and bruschetta, and makes a nice alternative to chimichurri† over a grilled steak. 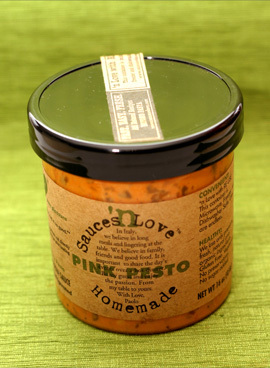 SnL’s sublime Pink Pesto is a mix of fresh tomatoes, a bit of pesto, some onions and a hint of cream. Its closest comparison would probably be vodka sauce, although the tomato chunks make this carnation-colored mixture significantly lighter. We were happy to eat it straight from the jar, off a spoon. For more civilized consumption, warm it up and serve over penne or chicken. †Chimichurri is a spicy vinegar-parsley sauce that is the leading condiment in Argentina and Uruguay, as salsa is to Mexico, served with grilled meat. It is made of chopped fresh parsley and onion, seasoned with garlic, oregano, salt, cayenne and black pepper, and bound with oil and vinegar. See our Salsa Glossary for more Latin American sauce varieties. Read our full review of Sauces ‘n Love, a NIBBLE Top Pick Of The Week. This shelf-stable line from Sauces ‘n Love (it will stay fresh without refrigeration for nine months) is available in the same varieties as the original. 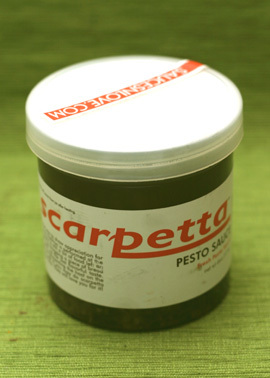 The two pesto lines are almost identical, but Scarpetta’s contains a bit more Parmesan than Pecorino (in the SnL version, they’re in the opposite proportion). It is as herbaceous, with just a little less bite. Scarpetta’s Pink Pesto is equally spoon-worthy, and ever so slightly creamier than SnL’s. Notably, Scarpetta is the Italian word for using a piece of bread to wipe up any sauce that remains in a bowl at the end of a meal—something you’ll certainly want to do to these products. Visit SaucesnLove.com for more information.